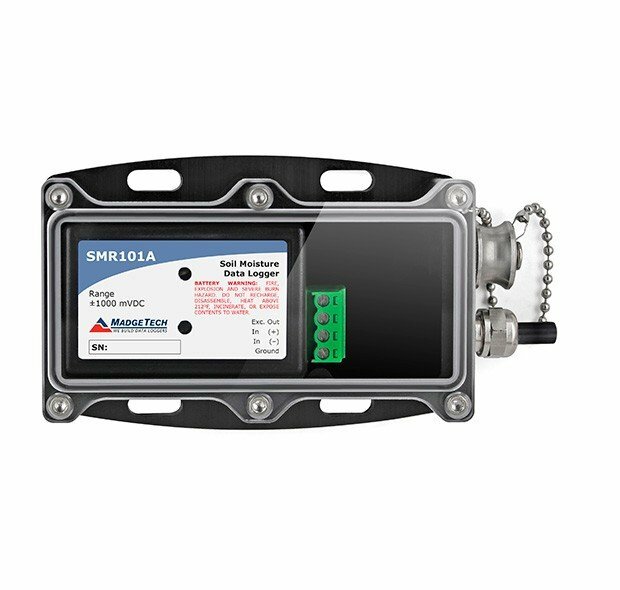 The SMR101A is a small, battery powered, soil moisture data logger in a weatherproof enclosure. It provides accurate volumetric water content measurements over a complete range from dry to saturated. The SMR101A has a 10 month battery for long-term deployments and soil studies, over multiple seasons. It also features a 4Hz reading rate, a multiple start/stop function, ultra-high speed download capability, 1,000,000 reading storage capacity, optional memory wrap, battery life indicator, optional password protection, and more. The SMR101A comes with the EC-5, a high accuracy soil moisture probe (pictured above), with a response time of 10ms, that can be used in all soil types. For easy soil moisture analysis and trend information, MadgeTech software provides a time and date stamped graph. This data may be viewed, printed or exported to third-party programs (Excel, etc…) for more detailed analysis and irrigation management. Soil moisture data is essential in determining and scheduling irrigation for proper plant growth, care and research. This data is also useful in determining the health of the soil and plant root systems.